Check out the amazing 360 sound solutions that ARKAMYS showcased at CES 2017 featuring both VR-Capture and-VR Play. There were a number of exciting trends and lists to come out of CES 2017. You can find a list of weird gadgets and a list of best new phones, and many lists citing VR as one of the most exciting trends at CES 2017. ARKAMYS was part of this innovative VR trend with its booth in the Virtual Reality/Augmented Reality section of CES 2017. 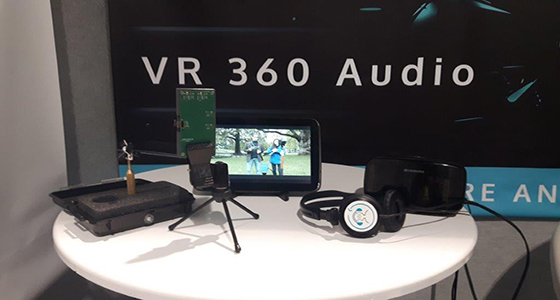 During the four days of CES 2017, ARKAMYS showcased its VR 360 Audio Suite via several interactive demos and with a few buzz-worthy prototypes. One huge highlight of the ARKAMYS booth was the 360 VR audio prototype, which used the ARKAMYS-designed microphone configuration and the ARKAMYS VR-Capture software solution to record and transform 360 audio. This VR audio recording software could be paired with smartphones or 360 cameras. Since the VR-Capture solution can be embedded on all types of devices, including cameras like the ready-to-use Giroptic IO or the Kodak PixPro SP360, it is easy to see why VR content creators would be excited about the VR-Capture solution. Many visitors wanted to walk away with the 360 VR sound-ready prototype that was on display at the ARKAMYS booth. They lamented the fact their favorite 360 cameras only recorded surround or stereo audio. “My camera already has several microphones, and with your software I could already be recording 360 sound!” was the frustrated cry of many who walked in the booth.Of course, with the ARKAMYS VR-Capture solution from these cameras could record 360 sound instead. The question of the day wasn’t if this solution would be available to mass market consumers, but how soon they could get their hands on it. There was a palpable excitement among consumers around which device would be the first to market with the VR-Capture solution. Many hoped their favorite device would be the first with the VR-Capture solution, so that they could easily capture 360 sound with their 360 cameras or smartphones. The other half of the VR Audio Suite by ARKAMYS was also on display as well. ARKAMYS VR-Play software featured several videos that allowed guest to the ARKAMYS booth the experience truly immersive 360 sound with 360 videos, including a video made with the ARKAMYS VR-Capture solution and the smartphone prototype. A number of audio experts also stopped by ARKAMYS’ booth and were excited by the technology and the level of expertise that the ARKAMYS solutions demonstrated. Many of them walked away with copies of the exciting white paper that ARKAMYS created titled “From the Laboratory to the Market: The Journey of 360 Sound for Virtual Reality Consumers”, which is available online as well. 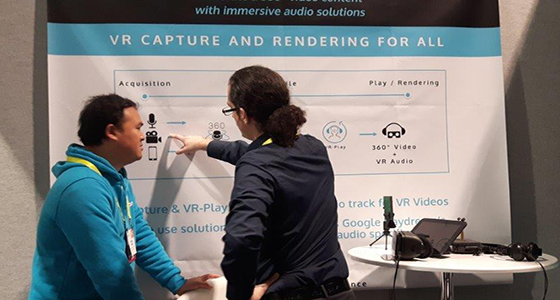 ARKAMYS was thrilled to be part of CES 2017 and overwhelmed by the excitement that suppliers, industry experts, content creators and consumers had for the VR 360 Audio Suite. It is clear that 2017 is going to be a good year for VR audio and that the VR-Capture and VR-Play solutions for the acquisition and replay of fully immersive 360 audio for virtual reality content are going to be a huge part of bringing VR audio to life. If you missed ARKAMYS at CES 2017 and would like a demo or would like to discuss the ARKAMYS VR 260 Audio Suite, please contact us!